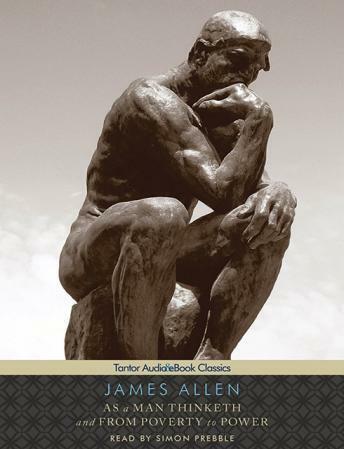 As a man thinketh audiobook written by James Allen and complement with the record of Brother Lawrence on The practice of the presence of God and narrated by Edward Lewis, the duration is for 2 hours 1 minutes. As a Man Thinketh is a small but very powerful book. It has provided mind-changing motivation for millions around the world. First published in 1902, the book has remained hugely impactful for over a century and is the inspiration behind many self-help books that teach on the power of the mind. The book’s title promptly reminds you of the bible verse, "For as a man thinketh in his heart, so is he." Proverbs 23:7. The central theme of the book is that ‘every man is a product of his thoughts’ and the exposition made in its seven brief chapters solidly establishes this point. The first chapter is on “Thought and Character” which explains how a man’s character is merely the sum of all his thoughts. Our thoughts determine how we react to life situations and in effect what life gives you in return. The second chapter is titled “Effect of Thought on Circumstances” and it contains a lot of wisdom on how you can be the master of your own destiny through your thoughts. The third chapter, “Effects of Thoughts on Health and Body” shows how our thoughts can actually influence our health condition. Allen writes that; "The body is the servant of the mind. It obeys the operations of the mind, whether they are deliberately chosen or automatically expressed." While a positive thought encourages good health, bad thoughts can attract sickness. You could call that wild assumption, but the author gives some startling examples. The fourth chapter of the as a man thinketh audiobook talks on “Thought and Purpose,” it advocates for everyone to have a purpose, a goal that defines their lives. Without purpose, one is easily derailed by fear. The fifth chapter, “The Thought-Factor in Achievement” still builds on the elements needed for success. In addition to purpose, hard work and persistence are also key factors expressed by the author. In the sixth chapter “Visions and Ideals,” the author advises that you dream big and set high aspirations as this helps put you on a path to greater achievements in life. “Serenity” is the focus of the seventh and last chapter, shows that there is wisdom in calmness, as patience will help build knowledge and experience. Get any audiobook FREE with a 30-day free trial.